Center care participation has remained consistently higher among preschool-aged children than infants and toddlers. Yet, most of the growth in the use of center care from 1995 to 2005 occurred among children under age three. For example, the number of two-year-olds in center-based care increased from 18 to 28 percent between 1995 and 2005. 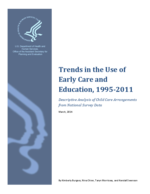 By 2005, two-year-olds were as likely to be in centers as in non-center-based care. For infants and toddlers (children under age three), the increase in center-based enrollment was driven by an increase in the use of centers with a family payment, and the number of infants and toddlers in center care without a family payment remained very low (under three percent). In contrast, for preschool-aged children, the increase in center-based enrollment seems to be driven by the increased availability and use of public preschool options during this period. Whereas private preschool enrollment for three- and four-year-olds exceeded public enrollment in 1995, this trend had completely reversed by 2011 when preschoolers were more likely to be enrolled in public preschools than in private preschools.